After training at Bath Spa University, Emily moved to Birmingham and set up her first ceramic studio. She has been working as a professional ceramicist for almost 14 years. 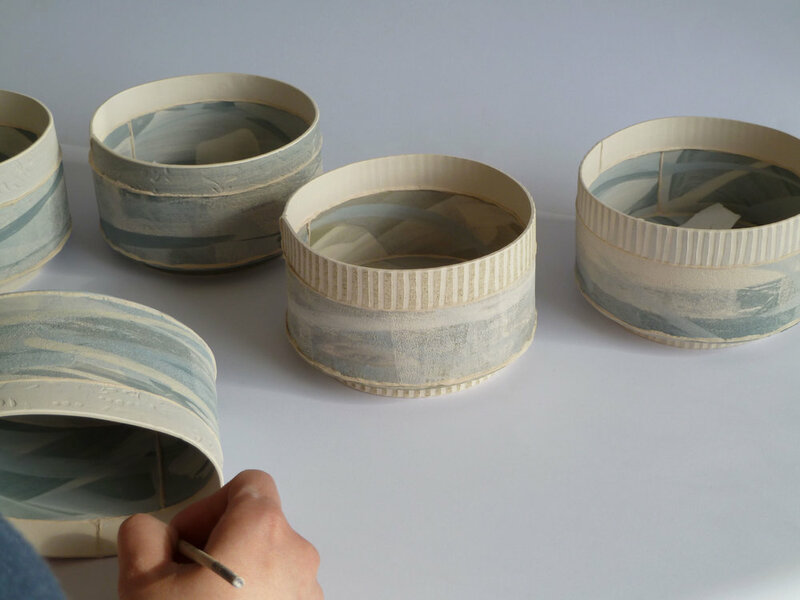 As a specialist in handbuilding, Emily has developed her ceramic practice to create pieces that are suitable for interior decor, with an emphasis on bringing elements of the outside world in to the home. Vessels are slabbuilt using a white earthenware body which is then treated to layers of decorating slip, underglaze, glaze and occasionally transfer and lustre to achieve the desired depth of surface. Pieces often go through multiple firings and as each is individual, the process of building up the surface varies accordingly. Emily is a selected professional member of the Crafts Potters Association, and a full member of the Gloucestershire Guild of Craftsmen.